Never despise humble beginnings. Majority of our students, above 10 years old, enrol in this course as it teaches the fundamentals of drumming. Unlike other schools, we focus on building a strong foundation in the early learning stage. We customize our lessons according to our students’ needs so that learning would be beneficial for both the educator and student. Our Beginner Course is designed to educate drummers who are exploring the instrument and have an interest in finding out more about this craft. The primary focus of this course is to provide an introduction to drumming, to develop the student’s understanding of essential drumming concepts, and to build a strong foundation in reading drum notations. At the end of the course, our students will receive an evaluation from our drum educator on his/her progress and development. We strive to bring the best in our students with fun and practicality, enabling a more enjoyable academic learning experience. * Course Fees Per Month. Here goes Georgia Farry’s first video recording with My Drum School. 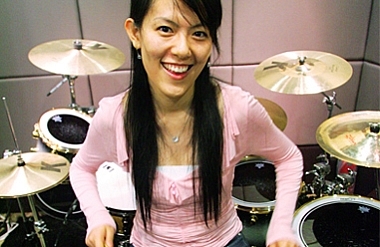 At the time of recording, she was still taking the Beginner Programme. This song was one of the requirements for her to complete to proceed to the next level. Look out for that awesome stick twirl in the middle of the song.